WHO WAS THE FIRST EVER FASHION DESIGNER? FASHION: WHERE WAS IT BORN? WHO WAS THE FIRST EVER FASHION DESIGNER? In our previous articles posted during the fashion weeks a little while ago, we spoke of Europe as the “continent of fashion”. It is here that fashion evolved and many of the most renowned fashion houses that we know as household names today started in the early years of the last century in the fashion capitals of Europe. It is here in Europe that “haute couture” still has its home and where the top designers meet every year to show their creations and celebrate the festival of “high fashion”. Over the years Italy has established its prestigious role in the fashion field, appointing Milan as the capital city of fashion: the first Italian designer boutiques in fact, were opened in Milan and the most famous designers usually present their new collections in Milan. We can certainly affirm that Italian fashion has always been linked to the city of Milan, and this beautiful city is still today, the symbol of style and elegance, the favorite destination of all those “fashionistas”, looking for the best in the matter of trends and style. At this point, you might easily assume that fashion was really born in Milan many years ago, that the first fashion designer was an Italian and that our country has always been the undisputed leader of fashion all around the world!!!! Italy, and in particular Milan has certainly given a valuable contribution to the development of fashion trends and styles in the world, but it can’t take the credit for having given birth to the very first “fashion designer”. This honor has to go to France and, in particular to Paris, where fashion took its first steps thanks to the skills of Marie Antoinette‘s personal court designer, Rose Bertin, at the end of the 18th century. Rose wasn’t a designer to start with, but just a fabric seller who attended the French court to offer her products for the making of the legendary queen’s dresses. She soon became Marie Antoinette’s lady-in-waiting and with the passing of time, she started taking charge of the queen’s look and styling. In fact, Marie Antoinette, was very young when she married Louis XVI and had to move from Vienna to Paris. She wasn’t used to paying much attention to her look and at first didn’t look like a royal princess. Her mother, the queen of Austria Maria Teresa, often wrote her letters, suggesting that she pay attention to her dress, her hair and her physical look, to establish her image as a powerful woman, given that she would one day be the new queen of France. Her individual fashion sense was given expression when, among her ladies-in-waiting, Marie Antoinette noticed the skilful fabric seller Rose Bertin, who immediately became her personal dressmaker and stylist. Rose totally adapted Marie Antoinette’s look, creating a special relationship with her. Marie Antoinette was probably the first “top model”, dressing in Rose’s creations and trying them out like a professional model. The first “fashion parades” took place at the spectacular Galerie des Glaces of Versailles among ambitious ladies-in-waiting, the king’s lovers, parties and love intrigues. At those special occasions, the Queen Marie Antoinette and the women of her court, could show off the beautiful creations of Mme Rose Bertin and display her talent for fashion and elegance, immortalizing her as the first official fashion designer. Marie Antoinette was so taken by her role of queen and by the desire to appear as elegant and fashionable as possible that she didn’t give a thought to the poor conditions that her subjects were living in. She didn’t think of saving money or economizing, but despite the economic crisis that France was now going through, she lost no opportunity of spending money on superfluous accessories and lavish dresses. 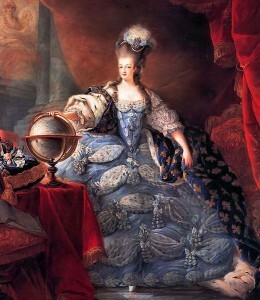 While her husband spent his time trying to find the best ministers to avert the crisis, Marie Antoinette, if possible, would have elected her personal dressmaker Rose Bertin as Minister of Fashion, so great was her esteem for this special woman who always guaranteed her the best in the matter of luxury and fashion. Are you interested in reading in more detail about the birth of Italian fashion? If so, don’t miss our next article!!!! !